Ah, soup. The perfect food for a cold, dark, rainy fall day – warm, comforting, nourishing. It makes hiding indoors from the elements just that much better. I have to give credit to the boyfriend for this soup idea. 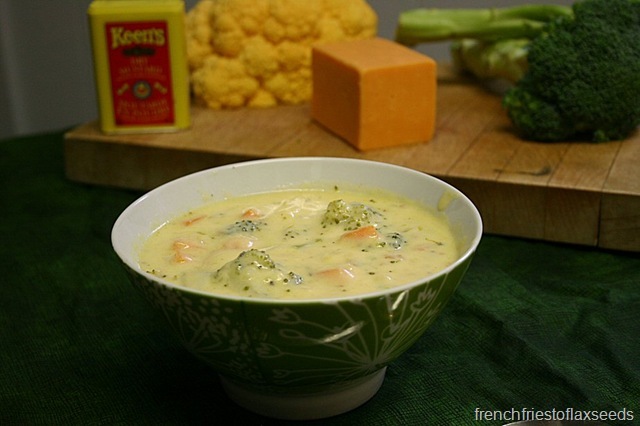 I believe we were grabbing a quick dinner one night at a sandwich shop, where he ordered the broccoli cheese soup. He made a comment about how it would be even better with some cauliflower in it (one of his favourite vegetables). I, of course, made a mental note – a meal I can pack full of veggies that I know he’ll enjoy? Perfect! Fast forward a few weeks, and I found myself making dinner for us. Cauliflower had been on sale that week at work (I went with orange for fun), so I knew the soup needed to happen. I gathered my ingredients, looked up some recipes for inspiration, and set out to make my own cheesy soup. 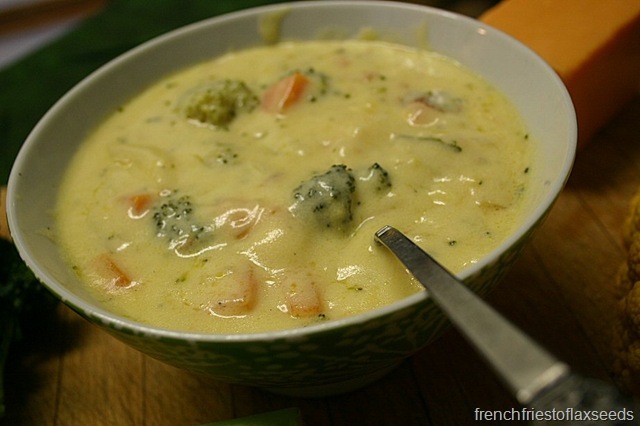 I wanted a creamy, rich soup, but couldn’t bring myself to use the cream/whole milk combos that most recipes called for. 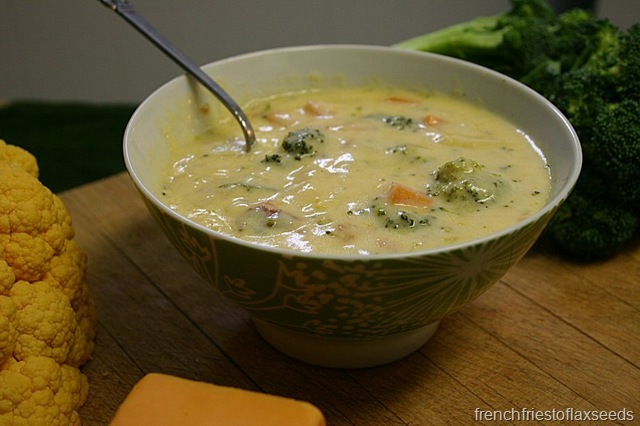 So instead I compromised, and went for a vegetable stock/whole milk combo with some really good aged cheddar. What can I say, sometimes I can’t turn the whole “RD” mind set off. Aside from a little chopping and grating, this soup comes together in a snap. No need to slave over the stove all day for a great soup – this is definitely week night dinner worthy. The real question though – what did the boyfriend think? He enjoyed it. He did say it wasn’t quite as creamy as some cream soups, but that it was delicious in its own right. He may have had seconds. I call that an endorsement. Just don’t ask him how the bread I made to go with the soup turned out… #bakingfail. 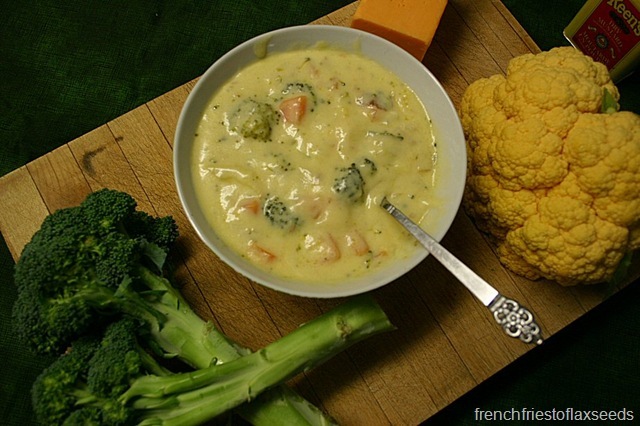 Enjoy your cruciferous veggies in this lighter version of the classic creamy, rich, cheesy soup. Paired with some crusty bread for dipping, it makes a great meal for the whole family on a rainy fall night. 1. Melt butter in a Dutch oven or large pot over medium heat. Add onions, carrot, and garlic. Sauté until onions are soft, but not browned. 2. Sprinkle flour over onion mixture, stir to combine, and cook 1 minute. 3. Pour in milk and stock, and stir to combine. 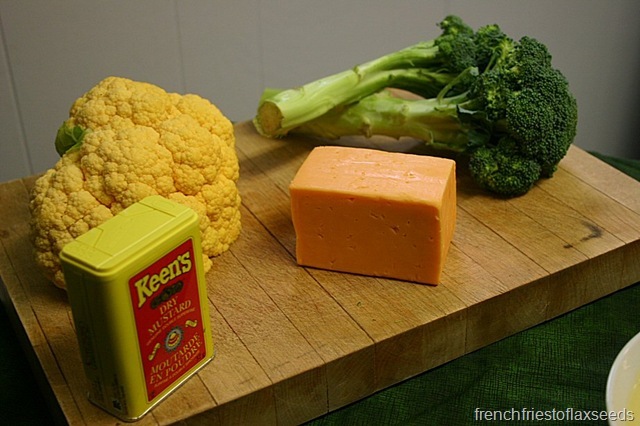 Add broccoli, cauliflower, and dry mustard. 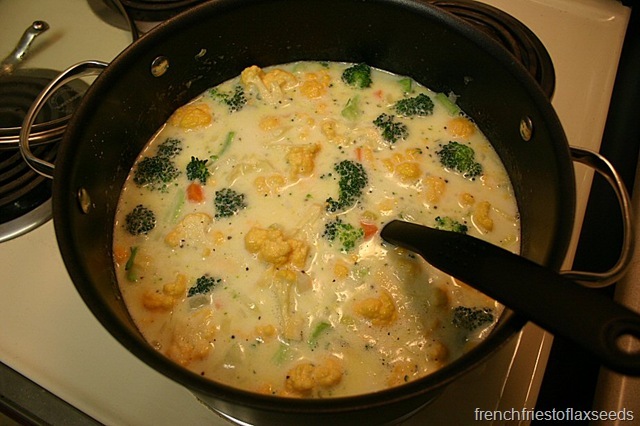 Cover, reduce heat to low, and simmer 20 – 30 min, until thick and vegetables are cooked. 4. Stir in grated cheese until it melts. Season with salt and pepper to taste. Serve. Note: If you want a smoother soup, you can mash the vegetables after they are cooked with a potato master, or even blend the whole thing for a super smooth soup. 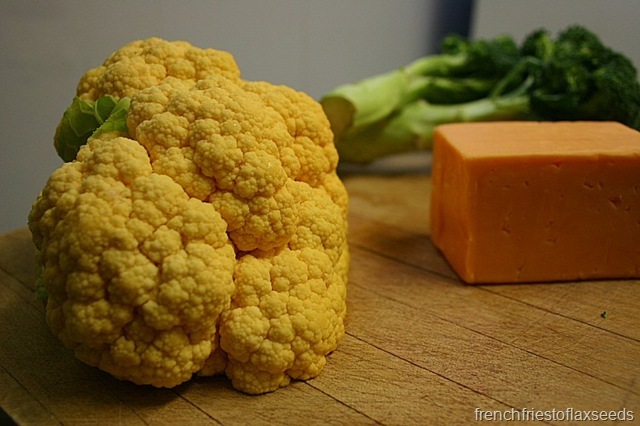 Which do you prefer – broccoli or cauliflower? That looks amazing. I am going to make this tonight, and serve it in bread bowls with one little change. I’m not a big mustard fan, so I’m going to use nutmeg instead. It never occurred to me to use both broccoli and cauliflower! I came across your recipe by searching for cauliflower soup. Thanks so much!